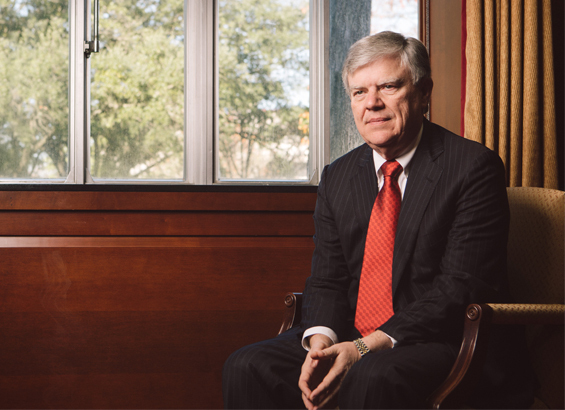 The University of Houston has named Dr. Stephen J. Spann founding dean of the UH College of Medicine. A seasoned physician, health care administrator and medical educator who holds both an M.D. and M.B.A., Spann was appointed planning dean for the college in fall 2015. Since then, he has shaped an academically desirable and financially feasible plan for the new college that will complement the current medical landscape in Houston and Texas. Spann’s vision for the College of Medicine focuses on preparing primary care doctors to practice in underserved urban and rural communities to ultimately improve health outcomes in Houston and across Texas. “Dr. Spann’s many years of training physicians and practicing in areas with health disparities uniquely positions us to accommodate the needs of Houston’s most underserved communities,” said Renu Khator, president of the University of Houston. "He is as passionate about closing the health care gap as our university is about supporting our city’s most critical needs. I cannot think of a person with clinical and business expertise more qualified to lead." "This is an important project to the Houston area and Dr. Spann is the person we want creating the model and building it. Too many people don’t have access to proper care and that’s not just a health problem, it puts a strain on our economy and makes this a less attractive place to create jobs," said Tilman Fertitta, chairman of the UH System Board of Regents. Spann graduated from Baylor College of Medicine and completed a residency in family medicine at Duke University Medical Center. He began his career as a family physician in rural Arkansas and North Carolina, embracing the challenge of providing quality care in communities with a shortage of physicians and poor access to health care. There is still a shortage of primary care doctors in America, and Texas ranks 47th out of 50 states in primary care physician-to-population ratio. Spann envisions a distinctive medical school that addresses the health and health care needs of communities with significant health disparities. The college will be centered on transforming the way high-quality care is delivered, taking a more cost-effective, patient-centric and team-based approach to care. Among his many goals, Spann hopes to attract and train more physicians from underrepresented minorities in medicine to better mirror the ethnic composition of the population. “Being named founding dean is a great honor and privilege, and it’s a great opportunity to do something significant that will ultimately have a major impact on health and health care of the population of this great city, our state and beyond,” said Spann. “I really love taking care of people and teaching young physicians how to take care of people, and then discovering new ways to provide better health and health care. Spann has spent most of his nearly four-decade career in medical education. He’s been on faculty and held leadership positions at the University of Oklahoma College of Medicine, served as chair of the Department of Family Medicine at the University of Texas Medical Branch at Galveston, and chaired the Department of Family and Community Medicine at Baylor College of Medicine. While at Baylor College of Medicine, Spann also served as senior vice president and dean of clinical affairs, overseeing a major part of that large medical enterprise. More recently, he served as chief medical officer at Tawam Hospital in the United Arab Emirates, which is a tertiary care teaching hospital managed by Johns Hopkins Medicine International. In addition, he was senior advisor to the Abu Dhabi health system. "Building a medical school from the ground up is a heavy lift and that’s why Dr. Spann is leading it. He knows medicine and he understands the business model," said Fertitta. Last November, the UH System Board of Regents approved establishment of a College of Medicine at the University of Houston. UH is seeking medical degree approval from the Texas Higher Education Coordinating Board and has initiated the process for accreditation by the Liaison Committee on Medical Education. The UH College of Medicine builds on interdisciplinary health research already underway. UH currently has comprehensive health professional training in nursing, pharmacy, optometry, psychology and social work. Other colleges will also make important contributions to medical training and research, including engineering, law, business and the Department of Health and Human Performance.